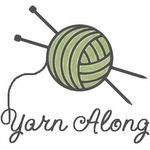 Another good yarn... and Blogiversary Giveaway Part 1!!!! 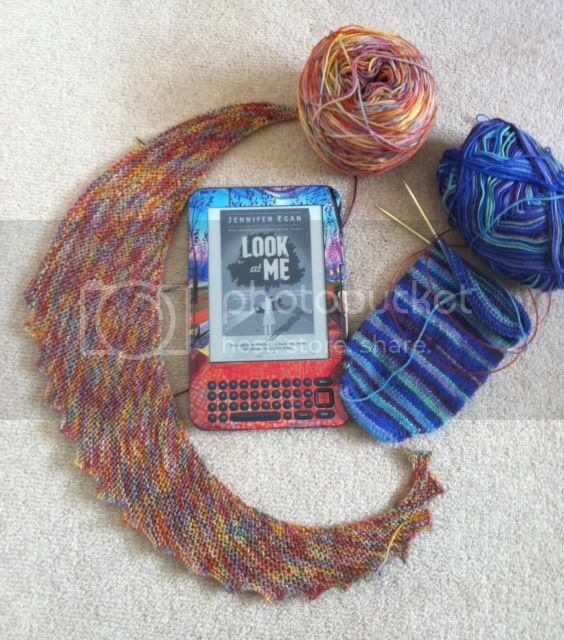 Today I'm joining in with Ginny's Yarn Along as well as Tami's WIP Wednesday as it's been a very bookish week. In the last 10 days I've read several books, which has been the unexpected silver lining to having surgery! I haven't read so much in the last 6 years since I stopped commuting. I've been reading Before I Go To Sleep, Room , The One You Love (I didn't love it, and will skip any further free books unless they are classics), Miss Peregrine's Home for Peculiar Children and now I'm onto Look at Me by Jennifer Egan. It's quite an engaging read so far (I'm about 38% through) and raises interesting questions about our own and others' perceptions of us and who we "really" are from the perspective of two Charlottes - one a New York model who has had facial reconstruction following a car crash and the other a plain looking teenage girl in a small town. I'll let you know how it goes. Onto knitting - my sock had a little progress a few nights ago, but since I cast on Hitchihiker, I haven't touched anything else. What a great pattern! I love the way it's shaping up - quite literally. 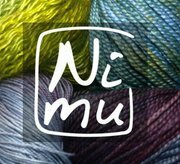 At the end of the month it'll be the CFTC one year Blogiversary and I have some great prizes to give away starting today, courtesy of the lovely Clare at Nimu Yarns. If you've been visiting for a while, you'll already know I'm a great fan of Clare's dyeing skills and one of the first things I made last year was Mizzle, knit with her gorgeous Torva. It's still one my my favourite 'finished objects'. My first published blog post was inspired by my day out at Unravel, which is where I first met Clare and got to stroke all her amazing yarns, so it seems fitting that for the first giveaway she has kindly donated a ticket to Unravel 2012. To enter, all you need to do is leave a comment below to let me know that you'd like to be entered, and that you'll be able to attend Unravel on either Saturday 25th or Sunday 26th February. Be sure to leave a method of contacting you (by email or link to your blog). The winner will be announced on Monday 20th February and I'll post the ticket out to you by 1st class post on Tuesday, so get your entries in before midnight on Sunday! It's an exciting day here, but I'll be back to tell you more about that another time. Loving the Hitchhiker pattern! Really nice shaping. I have put it in my Rav Library and i can see it's going to be on my needles soon. Lovel sock yarn too. I would love to be entered for the yarn though if I may. You know how to get hold of me if I am lucky enough to win! Good to see you've got your knitting mojo back after last week. I'd love to enter please. Perfect yarn choice for Hitchhiker - so much movement and swirl in the colouring! Good luck to all the giveaway entrants but no need to enter me! I'd love to attend but it's a bit too far for me, here in Toronto Canada! Love your Hitchhiker! I marked that as a Rav favourite earlier this month...such an interesting pattern. Ahhhh, the hitchhiker is looking lovely. I love that yarn! I love you yarn, so beautiful. that hitchhiker is really a lovely pattern when finished. you will get great use out of it i bet! Hitchhiker is on my radar of potential knits. It looks like it'd be a hoot to knit! Hitchhiker looks awesome! Sadly, I am in the US so I can't qualify for your giveaway... sounds like fun though - I can't wait to hear about it! It is good that you are getting back into your knitting, and hopefully doing good on the mend! Gutted, I would love to join the giveaway, but can't even think about getting there, think hubby would make me take all three boys and probably the puppy to boot! Ah, well I'm sure whoever gets to go will have a lovely time....one day it may be me! It is so nice when you have a pattern that you just love and your hitchhiker looks great. I love the yarn! You always pick such great yarn. Unfortunately, I don't live in the UK :O( but I'm going to Stitches West which is big out here in the USA. I'll stay tuned for your other giveaways. I would <3 to be entered into the giveaway!!!! I'm going regardless cos I want to learn to knit and what better incentive can there be than beautiful wool?? ?